Hey everyone! First, I would like to share some pretty exciting news…Over the past 2 days, my blog has gotten CRAZY AMOUNTS of recognition. Thanks to a website called Recipe Lion which features posts from lots of food blogs, I have gotten over 21,000 views in 2 days! It’s actually been slightly overwhelming (in a good way). Normally I get a small handful (about 4) comments a day. But since Tuesday, I’ve gotten about 50 comments and contact emails, and I’ve been slowly working my way through all of them! Anyways, I just wanted to share this news with you, my faithful followers, who have been reading my posts for a while now! This could also mean some pretty exciting things for the future of Normal Cooking! Stay tuned! Anyways, on to this awesome Enchilada dish. For starters, this is really easy to make, which is always a plus. AND it’s from a low fat cookbook so it’s actually not bad for you! Though I do apologize that I do not have the exact nutrition information, you can just take comfort in knowing that it’s low fat :-). These tasted great, too! My one complaint is that the recipe doesn’t specify what size tortilla to get, so I just got large ones. It turns out that the large size was a bit too big, and the filling inside got a little lost inside all that tortilla. So, just get medium sized tortillas, and it will be perfect! Cook beef and onions in a skillet over medium high heat; drain. In a bowl, combine beef mixture, sour cream, and corn. Divide mixture equally into 4 tortillas. 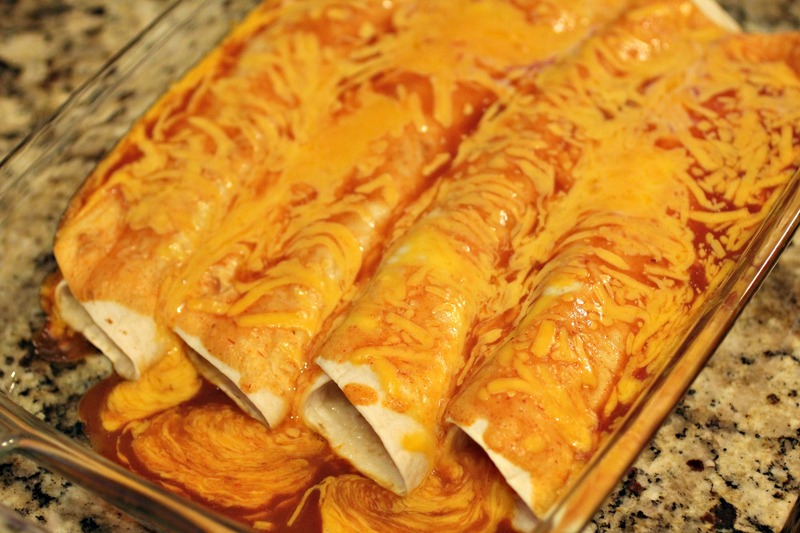 Top with a tablespoon each of enchilada sauce. Roll and place seam side down in a sprayed baking dish. 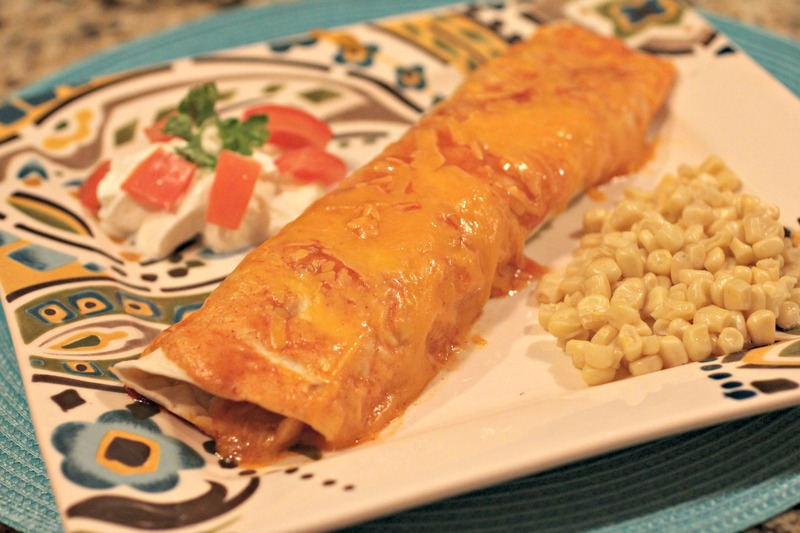 Pour remaining enchilada sauce on top and then sprinkle with cheese. Loving your blog, my first ever to follow I’ve tried two of the recipes since joining yesterday, so my man is loving it also He asked me after work tonight if I had checked you out to see what’s for dinner. He loved your BLT tomatoes Thanks for the ideas! awww thank you Sandra! Comments like this just make my day 🙂 Hope you and your sweet guy continue to enjoy some of my recipes! Thanks for following my site! So I have never found a recipe I didn’t change… With these my changes were pretty minimal! I added black beans (because yum), used homemade enchilada sauce (because I never have a jar of it on hand), threw cheese inside as well as on top (because I’m an addict), and used 9 mini tortillas instead of 4 big’uns. I still had a little filling leftover so I threw it in a small dish with cornbread on top. Not as good as the actual enchiladas but still pretty good! These were delicious! I think next time I would either add in some brown or Mexican rice or I would take out the beans and make it as is. Thanks for sharing this. Lindsay! Thanks Kyla! Your changes do sound pretty delicious, and I love your idea for what to do with the leftover filling! I usually just eat it with a spoon while no one is looking haha. Glad you liked it!